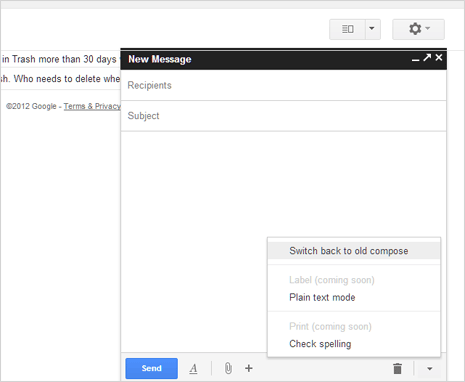 Gmail has introduced new format of “Compose box” for sending quick emails. New “Compose box” is like floating chat box with independent functionality. So while you compose new email message in the floating box, you can browse other emails in your inbox (for adding quick reference or for specific information searching). New ‘Compose box’ makes email writing more easy and quick task. With independent floating box, you will never lose sight of email being written – till the time you complete it! 1. 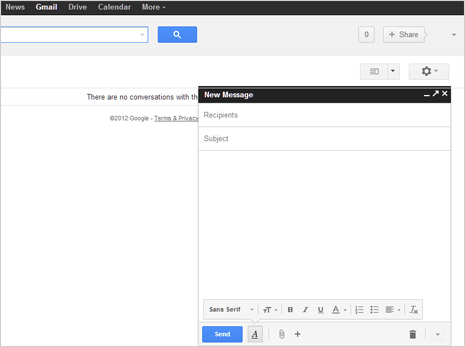 Once you login into Gmail account, click on “Compose” button at top left (like you always do to write new email message). You should see a pop-up informing you availability of new ‘Compose box’ in your Gmail account. 2. Click “Ok, got it” to close the pop-up box and then click on “Try out the new compose experience” button. This will enable new “Compose” box feature in your Gmail account. You should see “help” preview for using new Compose box in Gmail. 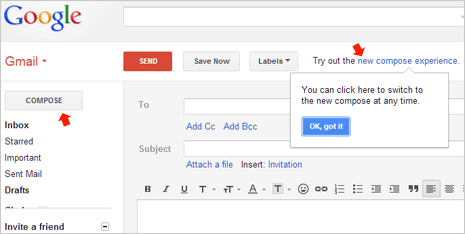 Incase you do not like this new addition, you can easily disable new compose box in your Gmail account. In the floating Compose box, click down arrow button and then click on “Switch back to old compose” box. This will switch back to original default compose email functionality in your Gmail account.